You are here: Home / Blog / Events / ATTN DIYers: Maker Mixer happens this Saturday, 2pm-6pm. ATTN DIYers: Maker Mixer happens this Saturday, 2pm-6pm. Everyone’s invited. 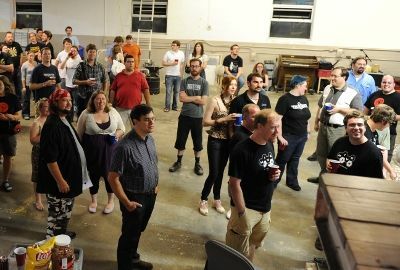 Originally conceived to connect busy Maker Faire exhibitors who didn’t get a chance to talk during the event itself, i3Detroit’s first Maker Mixer is open to anyone with a passion for DIY and a desire to meet more of their peers. Do you know of an individual or group who should be part of it? Please invite them! There will be snacks. Also fire and burgers, probably. Feel free to BYO, as well! The party is free but donations help us defray costs and are always graciously accepted. Parking will fill up. You might have to go down the block a bit to find a spot. We don’t have a big sign. Haven’t tackled that issue with the city yet. So study the map before heading out, and note that Wordsworth doesn’t cross through the train tracks — you’ll probably come down Wanda from 9 mile. We’ll have balloons on the corner to guide you in. There are more events around the corner. If you can’t make this one, consider the DIY Filmmaker Meetup on the 9th, the Get Lamp documentary screening on the 11th, or the Needlecraft Gathering on the 14th. https://www.i3detroit.org/wp-content/uploads/2014/03/Logo_large_png8-300x98.png 0 0 Nate Bezanson https://www.i3detroit.org/wp-content/uploads/2014/03/Logo_large_png8-300x98.png Nate Bezanson2010-09-02 11:31:072010-09-03 02:28:46ATTN DIYers: Maker Mixer happens this Saturday, 2pm-6pm. Hacker Business Series: Non-Profit Basics Pay it forward: Help another space buy a laser cutter?